Jonathan C. Smith joined Mackie Wolf Zientz & Mann, P.C. in January 2018 as an Associate Attorney in the Litigation Department. Prior to joining the firm, he represented various mortgage companies in areas of bankruptcy, title, and other real estate matters. 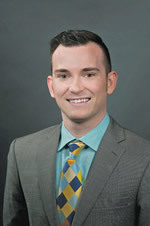 Jonathan received a Bachelor of Arts in Sociology from the University of Central Arkansas in 2013. He went on to earn his Juris Doctor from William H. Bowen School of Law in 2016. During law school, he was an active member of the Law Review team. Jonathan is a member of the Texas Bar and licensed in the U.S. District Courts for the Northern, Eastern, Southern, and Western Districts of Texas.